These four women are showing new work in the company’s annual showcase of emerging choreographers. If you want to discover the cutting edge of contemporary dance – and say you’ve seen the country’s next big choreographers before they hit the big time – Sydney Dance Company’s annual New Breed program is essential. Each year a crop of choreographers create fully staged works with the company for an eclectic and always thrilling night of dance at Carriageworks, with the extraordinary dancers of the company at their disposal. It’s one of our favourite shows every year. Each year the program grows more influential: one of the works developed through it – Gabrielle Nankivell’s ‘Wildebeest’ – entered Sydney Dance Company’s main repertoire and was nominated for a Helpmann Award. This year the four choreographers involved are all women, including Sydney Dance Company ensemble members Janessa Dufty and Holly Doyle, alongside freelance dancers and choreographers Prue Lang and Katina Olsen. We asked them a few questions about their experiences with the program. Can you tell us a little about your dance background? I began at Victorian College of the Arts in Melbourne – studying contemporary dance, ballet and choreographic practise. I joined Australian Dance Theatre for a few years, then moved to France. I worked as a dancer for many years in France and Germany. The most interesting and transformative experience was working with William Forsythe, where I experienced some very sophisticated methodologies around real-time composition and choreographic thinking. The company was very inspiring, and I was able to flourish as both a dancer and a choreographer. What do you find refreshing or innovative about New Breed? What makes it unique? This year I am thrilled to be part of an all-female line-up of choreographers for New Breed – it’s so refreshing! The creative process for New Breed is really short, so there is always a sense of “trying out an idea and see what happens” which I really love. In what ways has SDC helped in the development of your work? The SDC dancers are open, astute and dedicated to their practise, which has meant I can develop my choreographic ideas with integrity and rigour. The SDC team and collaborators are attentive and supportive which has helped enormously in the development of my work. What themes or concepts are you tackling in your piece? The piece explores predictions of future humans. Will they be aided, guided and minded over by artificial intelligences, keeping them constantly switched on to networks? Or will future humans prize disconnection in the same way we seek out Wi-Fi? And will the skills of deep human interaction, empathy, physical touch and the innate sensing of what other people are thinking or feeling become the most valued in their societies? In five words, can you describe what it’s like performing onstage? Jumping in the deep end! Have you experienced any adversity in the dance world because of your gender, and how have you combatted that? Yes, I have experienced sexism in the dance world and see that the dance sector in Australia has a clear gender equality problem. I have combatted this by speaking up about the issues throughout the dance sector (worldwide) and on a number of platforms. As such, my next project will be created with an all-female team (performers, composer, designers, producer, dramaturg, technician etc.) to illuminate outstanding creative, intellectual, technical and managerial achievements by leading women and present positive and powerful female role models for broad audiences. What are your predictions for the future of contemporary Australian dance? Are things becoming more diverse and inclusive? I hope that: the Australian dance sector will become more diverse and inclusive; that it will become a progressive field largely driven and directed by women and a breeding ground for empowering female bodies and minds in Australia; that contemporary Australian dance will more deeply value, respect and celebrate Indigenous culture. What sort of support do you think is vital for the growth of the industry, and wellbeing of the artists? Critical dialogue needs to flourish in the dance sector to enable greater conversations around dance. There needs to be equal support for established and emerging independent artists (at the moment there are far greater opportunities for emerging artists). Greater diversity in the artistic voices supported. Programmers and directors of arts venues should see artists as equals, seeking advice from artists when they have greater knowledge about the field. That artists are given opportunities to define their contexts, rather than creating boxes they need to fit into. What are you hoping your audience experiences or takes away from your work? A visceral experience. That the choreographic language triggers ideas of how humans could evolve in the future. A sense of both the darkness and luminosity of what these futures could hold. I started in classical ballet when I was five years old at Adele Lewis School of Dance in my hometown of Yamba, in Northern New South Wales. Receiving a scholarship at 15, I trained at Queensland Dance School of Excellence. Then with my new-found love for contemporary dance I continued to study at New Zealand School of Dance. My first professional job was with New Zealand Dance company Black Grace, with artistic director Neil Ieremia. I joined Sydney Dance Company in 2009, and since then I have worked with many incredible choreographers from Australia and around the world, including artistic director Rafael Bonachela. It’s a season that gathers talented aspiring choreographers and artists of different backgrounds. A time to share vision, knowledge and passion as well as a chance for experimentation in developing each individual’s craft. This collective sharing is very exciting. They have given me a generous platform to share my passion to create work. I have observed and been involved in the New Breed seasons from the beginning. 2018 is my turn to share and explore all that I have gathered over the years, using the learnings that inspired me to guide my developing skills in creating. I really enjoy progress and development and working creatively with my body. I also love working with interesting and talented people across all art forms, then being able to share that collaboration with an audience. The intriguing Australia wild flower Telopea Speciosissima, commonly known as the Waratah, is the inspiration for this piece. I’m referencing this magnificent flower’s qualities of strength, endurance, courage and healing. Its journey of adaptability through Australia’s harsh conditions, such as the cleansing nature of a bush fire, encouraged me to create dance through a memory of this flower’s vibrant bloom. How does your cultural background influence your work? My surroundings. Growing up in Yamba, a beautiful part of the world, has definitely influenced my work. Going back to memories of when I was younger surrounded by native bush blossoming with wild flowers. All the senses of the land from home are embodied in my memory. The surrounding street signs of the home I grew up in are names of wild flowers – my family home is on the corner of Telopea and Waratah Streets. My desire was to capture essences of the Australian land and the feelings and memories that come so easily to me. Magic, expressive, present, joy, satisfaction. I’m a strong character who likes a challenge, so if I was to come across any adversity it definitely strengthened my abilities in making me the person I am today. I also consider myself very lucky in the career I have had so far. Sydney Dance Company is a very supportive, open and accepting environment. To share a part of the journey and to stand amongst this year’s team of incredibly talented women is a massive honour. Yes. In today’s society, dance is at our fingertips, making the dance culture widen in diversity and inclusiveness. Technology plays a huge part in connecting with the international dance community. Hopefully technology doesn’t completely take over; we can’t forget that dance is a living art form and better to be passed on through human connection, learning and experience. More opportunities like New Breed! It is a wonderful platform for developing artists to grow and share knowledge. Passing on experience and ideas to the next generation is key. As it stands today, the artists’ community is blooming and the more we can all be aware and support each other through opportunity, the more it will continue to grow. One observation would be more help for transitioning dancers, as we know a dancer’s career can be short. Once your performing career comes to an end, the next step can be daunting without any support. I began dancing at Joanne Williamson Dance Academy at the age of three, following after my two elder sisters. I completed all my RAD ballet examinations as it was always ingrained that ballet was the most important foundation for any dance style. However, most of my training and love was in jazz dance. At the age of 12, I attended Newtown High School of the Performing Arts as a dance student. It was here that I was introduced to the multifaceted world of contemporary dance. I was also provided with countless performance opportunities, where I could grow as a dancer under the pressure of performance. From here, I received a traineeship with Sydney Dance Company and my professional dance career began. What are training schedules like for professional contemporary dancers? I can only speak from my experience in Sydney Dance Company as it’s my first professional setting as a dancer. When we are rehearsing at the studios, we will train Monday to Friday from 9.30am till 6pm (with allocated breaks, of course). I suppose it really is a fulltime job with the hours of any accountant or lawyer. Every morning begins with a warm up class of either contemporary or classical ballet to prepare our bodies for creation or repertoire rehearsal. However, when we are in performance season, for example, these hours become quite different. We may begin the day at 2pm with a warm up class to prepare and come together as a team, followed by rehearsal and notes for the show. This particular day will then go into a dinner break and then preparation for a 7.30pm or 8pm show. Another variation on our training schedule occurs when we are travelling around Australia or internationally on tour. In this instance we obviously have to factor in a new set of challenges such as travel days, rest days (from long flights), jet lag and new venues in each city. All in all, it is important to be malleable in switching to and from each of these schedules. 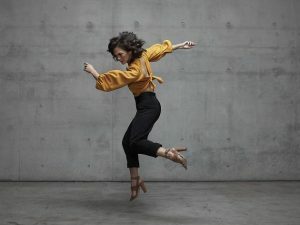 It is so unique because I get the time and resources to create a piece with world class dancers, lighting designers and costumes designers in a mind blowing industrial space that is Carriageworks. SDC has helped me develop my work in many different ways. On a practical level, I have been provided with great studio space and time to realise and experiment with my ideas. SDC has supported me with any assistance, feedback and questions I have had about my work. Being in SDC for the past six years, I have also developed tools and knowledge of how to lead a rehearsal. My piece is inspired by cleansing rituals. The work embodies the repetitive, cathartic and ritualistic nature of cleansing. I am exploring what it means to feel unclean and how we can experience ritual transformation and liberation. In five words, can you describe what it’s like performing on stage? Adrenaline, weightlessness, empowerment, single-mindedness, eager. Personally, I have not experienced adversity in terms of my gender throughout my six years as a professional dancer. I’m not disregarding the fact that some people do experience gender adversity in the industry, however, working for Sydney Dance Company has not presented any gender inequality. What are your predictions for the future of Australian contemporary dance? Are things becoming more diverse and inclusive? I think it will constantly grow and evolve because dancers and choreographers will always have something new to say. Diversity is definitely on the rise in contemporary dance. There are many dancers around the world currently experimenting with and performing movement languages and concepts that have been practiced for decades. Dancers and choreographers are also introducing new movement dialogues through further investigation and the evolution of the dancing body. What sort of support do you think is vital for the growth of the industry and wellbeing of the artists? Education and knowledge! Educating young students and young artists is pivotal for the forward motion and growth of the industry. I can only speak for the growth of contemporary dance in relation to the growth of the entire industry, and I believe it is these young artists that need to be exposed to countless techniques and knowledge of contemporary companies around the world. In Sydney Dance Company for example, there is a strong focus on reaching out to as many students as we can in Australian schools and internationally. I hope they take a look (with humour) and notice the unconscious or conscious cleansing rituals in their day to day life. I trained in a few different styles (ballet, tap, jazz, contemporary) from a young age, but my professional career has been mainly contemporary-focused, working as a performer throughout Australia and internationally, as well as more recently focusing on my own choreographic voice. As a freelance performer and choreographer our training is usually self-determined when we’re between projects. In these times I like to run and practice yoga, but also take class when I can. I tend to adapt this depending on what my next project is and what kind of style it will be. I practice more yoga if I’m working with a choreographer that requires a more malleable body, or run more often if the choreographer is using sports as an inspiration for the work. New Breed offers an amazing opportunity to work with dancers that I usually would not have the chance to. I’ve been lucky to be part of an amazing community of dancers and dance makers here in Sydney, but it is also refreshing to work with Sydney Dance Company’s dancers who are usually busy with their own schedules 12 months of the year. SDC, Carriageworks and also the Balnaves Foundation have given an opportunity to not just develop new work but to also support it into production. At a time when it is increasingly difficult to secure funding, studio space, producing and production support, all of this is supported in one awesome package where we as artists are able to just focus on the choreography and building the work. In this work I’m looking at post-apocalyptic ideas and also stories from my people about where we go next. How does your cultural background influence your work? Do you consider your heritage as a driving force behind your practice? My heritage is absolutely a driving force in my practice. I have this great platform to be able to share story that my Wakka Wakka and Kombumerri ancestors weren’t able to, so I consider where I am as an artist is very much a privilege. However, as an Aboriginal artist this privilege also holds responsibility and that is contributing to the continuum of our culture. As much as I am myself and an individual, I am still representing my people; my ancestors are always watching how these stories are shared. Liberating, rewarding, powerful, cathartic and exhausting. Absolutely. There are definitely times where I’ve had to work twice as hard as my male counterparts both in performing and choreographing. Conversations now around gender equality are changing for the better, but there is definitely sediment from old school ways still very present in our industry. Although I am, of course, so grateful for all the opportunities I’ve had so far with my career, I also wonder how things might have been different if we had even more women in leading positions of power within not just the dance world but also within our political systems. From the current conversations that I’m part of, I feel that we’re two steps forward and one back, but there is a gaining of momentum around understanding the importance of diverse voices on stage as well as leading and making the work. We definitely need more First Nations representation but more importantly to hand over to First Nations people to make and lead their own programs is where we need to keep going. We need so much more support from Government for the small to medium sector. It is so heartbreaking each year to see arts funding dwindle and artists continue to make incredible personal sacrifices and make work with less and less support. I would love to see our independent artists here one day respected and supported like our European counterparts, especially between projects, so we’re able to dig deeper into the research of our work and also build futures for ourselves.